What do you want to do when you grow up? A ticket taker... a pizza maker...? A wrestler, a writer or maybe a waiter? A whole host of silly and sensible options dances before your eyes in this rhythmic, rhyming cavalcade of jobs. What do you want to do when you grow up? A ticket taker... a pizza maker...? A wrestler, a writer or maybe a waiter? A whole host of silly and sensible options dances before your eyes in this rhythmic, rhyming cavalcade of jobs.This title belongs to the highly acclaimed Beginner Book series developed by Dr. Seuss, in which the essential ingredients of rhyme, rhythm and repetition are combined with zany artwork and off-the-wall humour to create a range of books that will encourage even the most reluctant child to read.Originally published under the pseudonym of Theo LeSieg, Maybe You Should Fly a Jet! 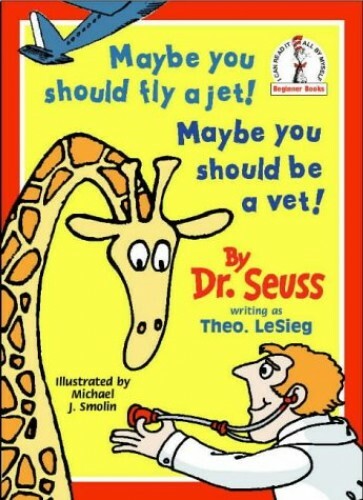 Maybe You Should Be a Vet! is being relaunched with a stylish new cover design which reveals, for the first time, the true identity of the author - Dr. Seuss himself!